Cole is sent back in time from a post-apocalyptic 2043 where a deadly disease has ripped through the human population. He is tasked with finding the source of the plague and putting a stop to it, hopefully saving the human race in the process. We’ll see how that goes. In the film, Jeffrey is a manic animal rights activist and the son of a wealthy industrialist. Cole initially suspects that he is the one who releases the virus on behalf of the Army of the Twelve Monkeys. It sounds like most of this story will remain intact in the new incarnation. We can only hope that Hampshire will have a weird eye and be just as twitchy as Pitt was. Goines is one in a series of roles that, for me, proved that Pitt could be more than just a pretty face, and that he could actually act. And cards on the table, my first band in high school used samples of some of his rants between songs on a demo tape (just in case you were wondering how old I am). Suffice it to say, I have an affinity for the character, so I hope that this new version does the original justice. I don’t know enough about Hampshire either way to have much of an opinion on this casting, so we’ll just have to wait and see. Hampshire isn’t the only new addition to the 12 Monkeys cast. 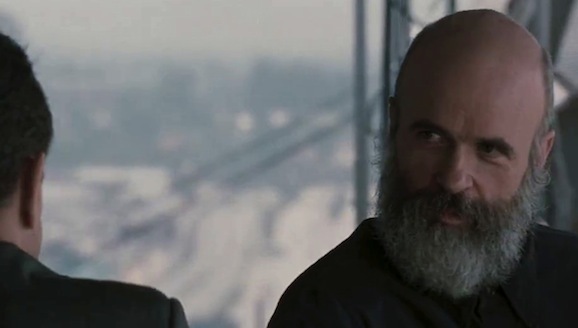 Tom Noonan, who played one of the creepiest, most unnerving villains in movie history in Michael Mann’s Manhunter, has also signed on to appear in the upcoming series. He plays an entirely new character, the public front for the Army of the Twelve Monkeys. The press release states, that he is “Imposing and intelligent” and will “be at the center of the conspiracy.” We’ll see what impact that has on the larger story—there’s and entire world for the series to explore that is only hinted at in Gilliam’s film—but as far as bad guys go, you don’t get much better than Noonan in that realm. This trailer should give you a better idea of how the series is changing the tone and feel of the source material. 12 Monkeys is scheduled to begin production on August 6 in Toronto, and also stars Amanda Schull as Cassandra Railly, a reworking of the role Madeline Stowe filled in the film, Kirk Acevedo as Ramse, and Zeljko Ivanek.